Missions exploring the Solar System provide a wealth of images that are interesting not only for scientists, but also for the general public. However, the use of the Planetary Science Archive requires some knowledge of the missions and their data that is beyond reach of most non-science users. For this reason, the ESDC has developed the Archive Image Browser, a service providing images from planetary missions for non-experts. Users of the Archive Image Browser can explore the several image albums available, including the most visited and the most recent images. An advanced search interface is also provided, where they can perform searches based on specific keywords, author names, post date or creation date. Users can then download their favourite images or share them in social media. The service is very popular, with monthly averages of about 1,500 users and 10,500 pages viewed. 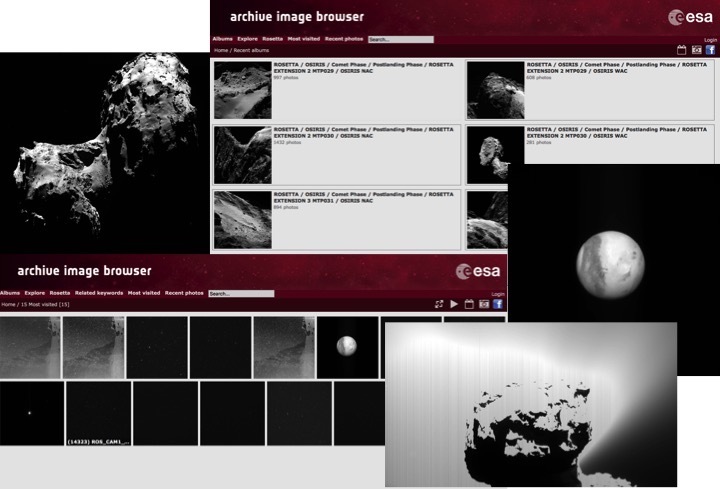 On April 24, the Archive Image Browser experienced a peak of 30,000 users in one day, probably related to the publication of an animation created from Rosetta images of comet 67P/Churyumov-Gerashimenko that became trending topic on Twitter. A proof of the interest of the general public on this kind of visual applications. The Gaia Archive registered in April the largest number of users ever seen at the ESDC, with peaks of up to 1,700 new users per hour. Virtual Observatory technologies were key in this success. This version includes a new image viewer for interactive analysis and the new release of the 3XMM catalogue, among other improvements. The next Interoperability Meeting of the International Virtual Observatory Alliance will take place in Victoria (Canada) from May 27 to June 1, 2018, with strong presence of the ESDC. On April 25, at 12:00 sharp, thousands of astronomers worldwide logged into the Gaia Archive, or searched for “Gaia DR2” in TOPCAT and selected ESA or another one of the available data services, with the purpose of performing significantly complex queries over the impressive 1.7 billion source catalogue. But very few were aware that perhaps the most intensive and decisive operational test since the creation of the Virtual Observatory in 2002 was running at that precise moment. And it was a successful test. The VO behaved as good technologies should behave: transparent to the users, empowering them to do more and reach further without even noticing the complexity of the standards and technologies behind the interfaces. The use of a common, worldwide known open standard that is accepted by all services, the Astronomical Data Query Language (ADQL), allows users to concentrate on the immense potential of this dataset, built upon decades of effort of the Gaia Mission and the Gaia Data Processing and Analysis Consortium (DPAC). 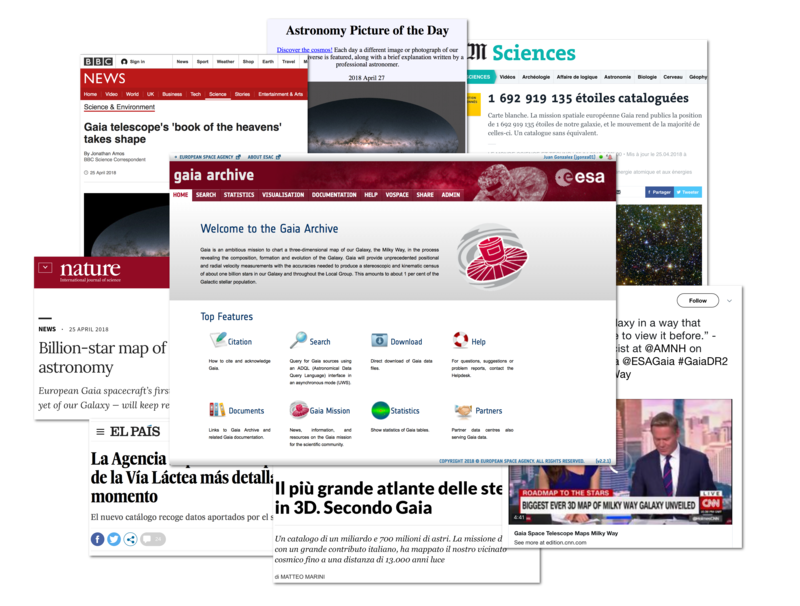 Many users decided to use the ESA Gaia Archive interface, interfaces of partner data centres, other VO tools, or the specifically developed Python Astroquery Gaia library. 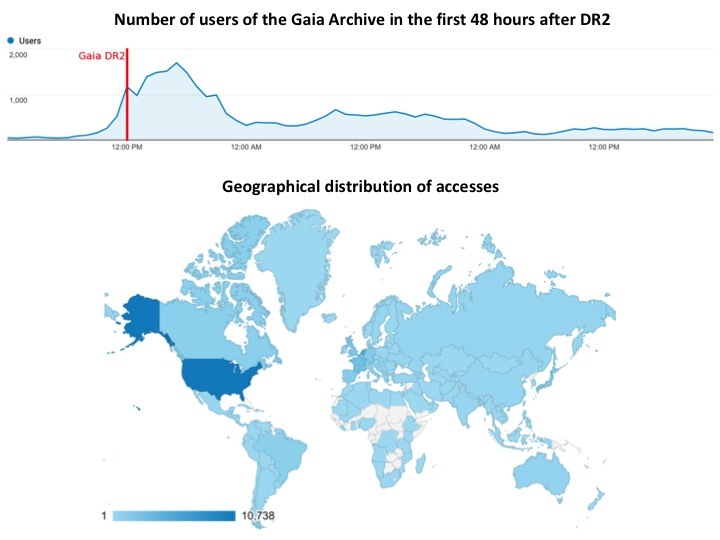 Usage numbers for the first week speak for themselves: 34,000 users accessing the ESA Gaia Archive interface, with peaks of 1,700 new users per hour; over 5,000 users sending more than 1,5 million data analysis queries, and a total retrieval of 118 Terabytes of data. These are the largest numbers ever seen so far for any ESA science archive. The VO-orientation of the Gaia Science Archive is the result of the many years of involvement of the ESA Science Data Centre (ESAC) in the International Virtual Observatory Alliance (IVOA) and of the contributions through the Gaia DPAC of many partners and experts. VO technologies are now "release proven" (i.e. can accept very large peak loads), combining reliability with functionality, and making them an attractive option for future missions. 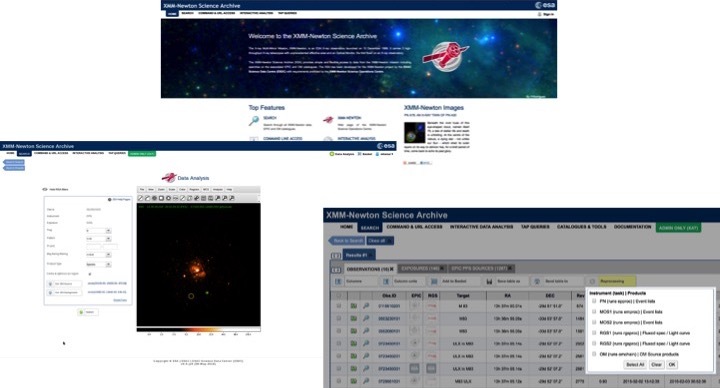 Since May 16, interactive analysis of data in the XMM-Newton Science Archive (XSA v10.0) is much more straightforward than in previous versions, thanks to the new image viewer integrated in the Remote Interface for Science Analysis (RISA) in the latest version of the archive (version 10.0). This image viewer, JS9, is a light version of DS9 that allows users to visualise and manipulate astronomical data in their browser. This new version of the XSA also features the latest incremental release (DR8) of the XMM-Newton EPIC Serendipitous Source Catalogue (3XMM), based on public observations up to November 2017 in the energy range 0.2 to 12 keV. The catalogue covers a total sky area of about 1089 square degrees, and it includes 775,153 X-ray detections from 531,454 unique X-ray sources. This represents an increase of approximately 7% in the numbers of unique sources with respect to the previous release (DR7), dating from June 2017. In addition, XSA v10.0 gives for the first time access to the Radiation Monitor files, allowing users to select and download those data. This version provides improved searching functionalities and a new design of the archive home page. The International Virtual Observatory Alliance (IVOA) is a worldwide organisation aimed at enabling global and integrated access to astronomical data. It achieves this by debating and writing the technical standards and protocols that are needed to make the Virtual Observatory (VO) -the vision that astronomical datasets and other resources should work as a seamless whole- possible. Members of the ESDC, representing ESA, have been involved in the IVOA since it first formed in 2002. Standards that have been co-written by the team include the access to spectroscopic data, spectral line databases, a data model for photometric data, the Astronomical Data Query Language (ADQL) for querying astronomical databases, the access to sky survey data, amongst others. Furthermore, the ESDC has actively implemented those standards to create VO-enabled archives and applications, making VO a reality for the science community. Currently, most of our new archives are using a VO-compliant architecture. The IVOA meets every six months at the Interoperability meetings to discuss and develop the VO standards and VO-based applications. The Northern Spring 2018 Interoperability meeting is being held on 27th May to 1st June in Victoria, Canada, and is being hosted by the Canadian Astronomy Data Centre (CADC). As usual, members of the ESDC team will be attending the upcoming meeting, will present recent work, and will represent the ESDC and ESA in the Executive Committee, the Committee on Science Priorities and the Media Group. The Mars Express instrument teams continued delivering data to the Planetary Science Archive in March and April. New data on the composition and structure of the red planet are now available, including new raw subsurface data from the Mars Advanced Radar for Subsurface and Ionospheric Sounding (MARSIS) and new OMEGA (Observatoire pour la Minéralogie, l'Eau, les Glaces et l'Activité) raw data until June 2017, as well as radiometric data taken with the High Resolution Stereo Camera (HRSC) up to October 2016. New ASPERA-3 (Analyser of Space Plasmas and Energetic Atoms) raw and calibrated data covering up to June 2017 have also been released. 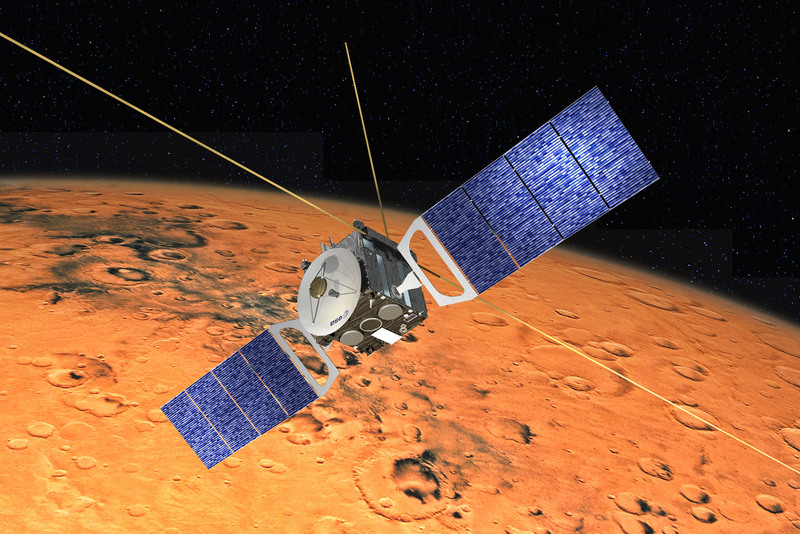 The goal of this unique instrument is to study the interaction between the solar wind and the martian atmosphere, with the ultimate goal of finding the answer to the problem of the lost water on the Red Planet.